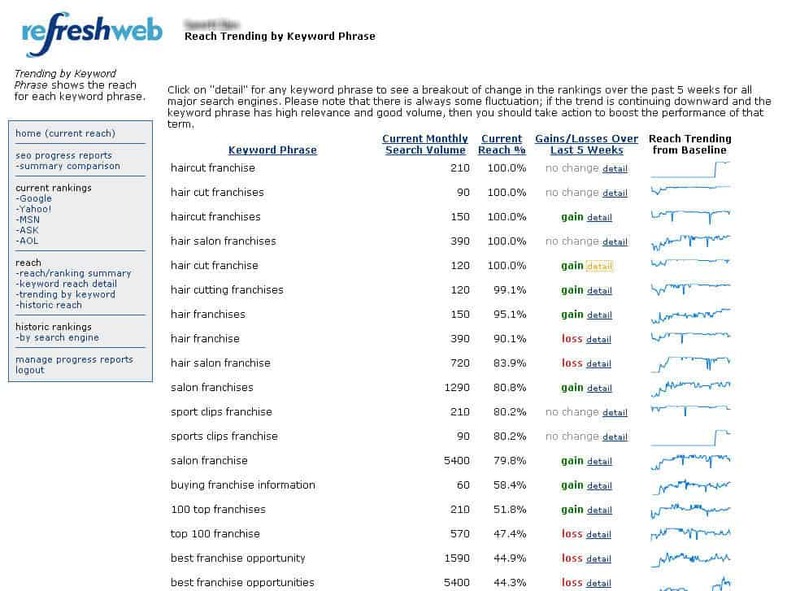 Our friends at RefreshWeb down in Austin recently released a version of their SEO Dashboard tool to the general public. John Rasco from RefreshWeb graciously gave us a tour of the tool, and I’ve got to tell you, this is something search engine marketers do not want to be without. It is rare these days that a new tool for SEO metrics is unique and useful, but RefreshWeb’s SEO Dashboard is both. The basic concept of this SEO metrics tool is to provide an easy to understand snapshot of how big your market is, and percentage of the market share you have captured. The tools also provides a quick way to identify places where working on improving your SEO may have biggest bang for your buck. The TASMReach is the home page for the client (Total Available Search Market™ TASM™). 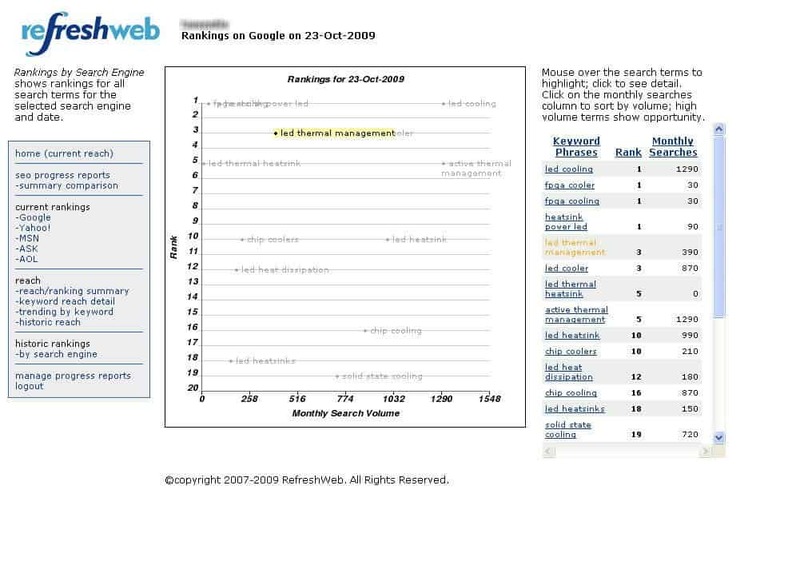 It shows the percent of TASM reached as well as the current search volume for each term. Mousing over a term in the table highlights it on the chart. The GoogleRankings uses the same technology to display the results, but you’re looking at rankings instead of reach. 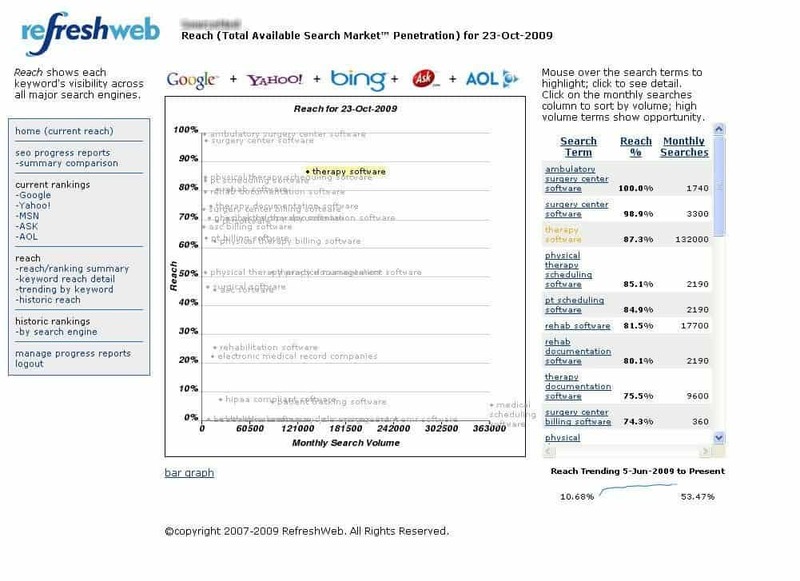 All 5 of the major U.S. search engines are tracked. 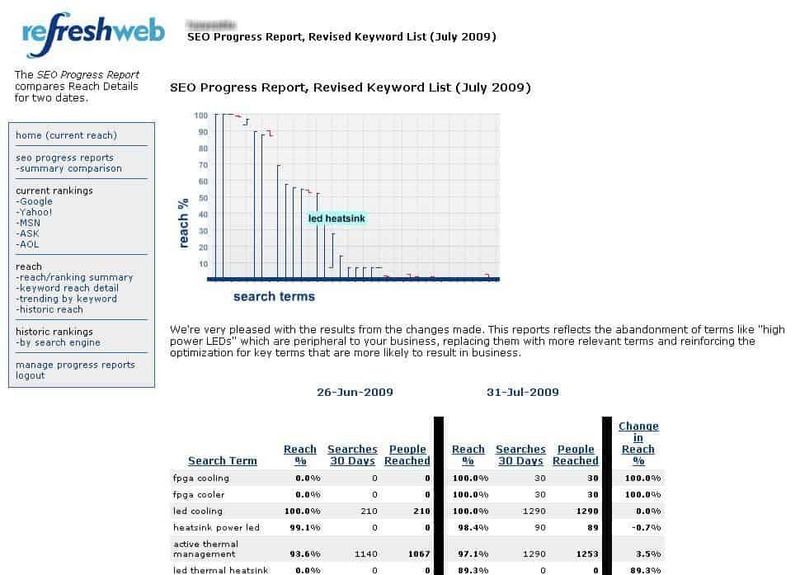 The SEOProgressReport compares the results from any two dates in the system, with the bar graph at the top representing gains and losses. Highlighting a bar in the bar graph displays the search term associated with that result. The KeywordTrending report give you an overview of gains and losses for the current date, with the keywords linking to a 5-week tracking of rankings, so you can see if the trend is moving up or down. Weekly rankings for any term can fluctuate, based on factors such as the 19 different Google data centers in the U.S., where the Googlebot is in the indexing, etc. So, you need to be able to see a slice of the history to see if you have an anomaly or a problem. The SummaryComparison chart is a great tool for showing management progress over time, but summarized into total terms in each ranking category. This helps keep the reporting at a high level. All the detail is available through the system, but it’s hard for someone not familiar with SEO or the work in progress to utilize granular information. Currently the SEO Dashboard is sold bundled with SEO consultation services and is geared more towards marketers than SEOs. I’ve spoken with RefreshWeb about future releases and a white label-able non bundled version is in the works. If you would be interested in this I would encourage you to contact RefreshWeb and let them know. That looks really valuable for base-lining then tracking progress. Would be really nice if it could pair the progress report with a traffic report per keyword over the same period of time. Thanks for sharing this. I’ll be sure to express my interest in the white label version. Thanks, Toby…you’ve definitely hit on what I like about the dashboard for “client management.” You have the graphic display of how much progress you’ve made, and you capture the history. We’re planning on a Google Analytics API as well as our own API in the next version. That will make the keyword traffic metric you’re asking for possible.